Cheng & Tsui, an independent publisher and distributor of English and multilingual educational materials about Asia, has made a generous donation of new books to the Storefront Library. At a meeting today of the Friends of the Chinatown Library, community members got a chance to inspect some of the titles and were especially pleased by the donation of bilingual children’s books. 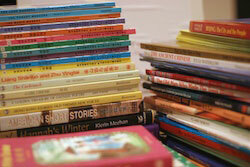 Many thanks to Cheng & Tsui for the book donation and their enthusiastic support of the Storefront Library project. Cheng & Tsui features a wide range of Asia-related products: language textbooks, literature in translation, scholarly works, curriculum support materials, computer software, films, and educational games and tools for all age groups. Cheng & Tsui Company is located in downtown Boston at 25 West Street, just up the street from Chinatown, and a short walk from the Park Street (Red and Green lines) and Downtown Crossing (Red and Orange lines) T stations.